Felix is a huge fan of the Octonauts, and subsequently I decided she needed a plushie one of her own! 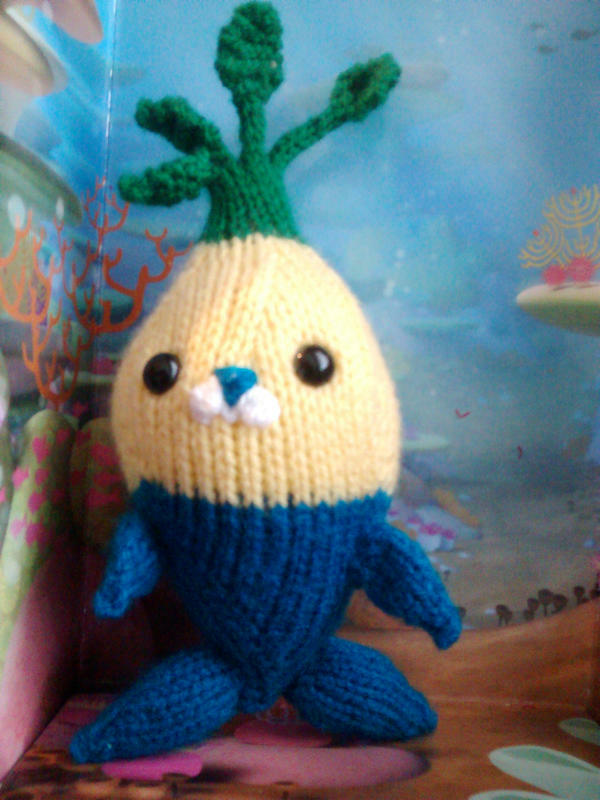 But after some searching, couldn’t find any knitted ones, so…Tunip was made! With blue, CO 3 sts, split onto three needles. Repeat round 5 and 6, decreasing the numbers in brackets by 1 each time you repeat round 5, until 18 sts remain. Stuff firmly, and add safety eyes at this point if being used. Use photo for reference. Change to Green, k 1 round. Work 1st 3 sts as I-cord (leaving the remaining 9 on spare needles) and I-cord 10 rounds. Leaf – Working 3 sts flat, inc 1, K1, inc 1. Next row: K3tog, cut yarn and pull through. For the second stalk, take the next 2 sts of the remaining 9, and the last st (so three in all) work 6 rounds I-cord then leaf. For the third stalk, take the 1st st of the remaining six, and the last 2 (s three in all) work 3 rounds I-cord then leaf. For the last stalk, take the remaining three sts, I-cord 1 round then work leaf. With blue, CO 10sts, join in the round. With blue, CO 12sts, join in the round. Lightly stuff limbs then sew to body, using photo as a reference. Tuck in all loose threads. Sew on snout by using white and blue wool, use long sts to obtain a flat and more solid looking face. Give to happy recipient, or make two, and keep one for yourself. Pattern is on Ravelry, so if you make one or many, please put photos up! Pattern is copyright to Foxymitts.co.uk, do not use pattern to sell or make for profit. I’m doing your tunip pattern but can’t work out how to do the nose. Can you help please. All I did was embroider a small blue triangle for the nose and two little white circles either side. Just takes a little patience and practice! Hi, any chance you could help me convert this pattern to a hat? I think I can work out the head, looks like a basic beanie shaped decrease, but I’m not sure how to size up the little leaf on top. It’s so cute, I would love to make my toddler a hat like this for Christmas and would credit you on Ravelry! Thank you! That would look adorable! Will email you a full response with some suggestions when I get a chance.